When Ven. 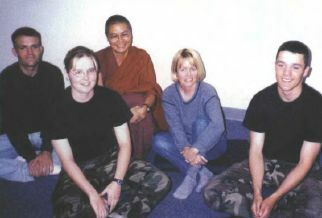 Tenzin Kacho was asked to be Buddhist chaplain at the US Air Force Academy in Colorado Springs, she read up on WWII so she could learn about the conflict of war and how people dealt with it. She conferred with a family friend from a lineage of Japanese Buddhist ministers who had served in the WWII US Military Intelligence Service, even while his father was imprisoned in the internment camps for being a minister. Sometimes she feels unsettled about her work and wonders if she is serving the war effort. She tries to focus on being there for the individuals.